We can reassemble torn or destroyed photos, remove scratches, crumples, dots, fix or replace backgrounds, replenish colours, and repair water or mold damage. Any photo can be fixed especially when consulting with professionals such as us, the PicPro team. 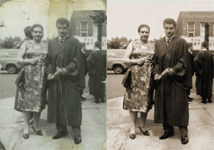 Our photo restoration service is our most extensive level of digital repair, and we are acknowledged experts in photo restoration. Our advanced photo restoration techniques allow us to return nearly any photo to their former glory, even those damaged by fire, light, water, mold, pets, or children. Almost any image can be restored. Just show us your photos and get a free consultation with specialist prior to making any payment. Most common type of damage. All pieces should be brought and scanned. After that, our specialists start restoration process: nearly destroyed photos put back together, pixel by pixel, with attention to the details. Common with slides and negatives, which are sometimes kept in humid environments, like basements. The photo on the right is an example of advanced photo restoration that both removed the mold damage and also restored the color balance. Repair of water-damaged photos and repair of fire-damaged photos are often related, since the water used to fight fires often damages photos. This level of damage requires experts in photo restoration. Pricing is based on the time it takes the artist to reapir the photo and the skill required to restore the image. 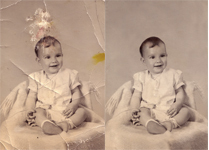 We are usually able to complete the restoration of your images within a couple days to a week from the day you approve the quote for photo restoration. Providing us with guidance on what to restore in your image is optional. 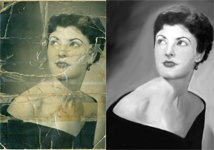 Our restoration artists are very experienced and know how to repair damaged/poor images. However, if you have special requests, you can give us special instructions.